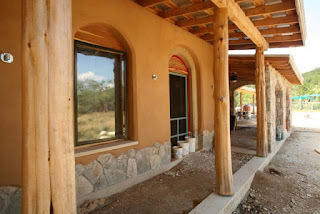 In the 1990s I began to look at alternative building methods for sustainable living. For most of the past 12 years I thought monolithic domes were the way to go, because I didn't understand how cement out gasses CO2 for a long time. Granted, if anything-proof is the goal, the dome is it. But for our purposes we've decided it's better to focus on all-around sustainability rather than disaster-proof. This decision reflects a fundamental shift in our priorities, too. We are no longer fearful of an apocalyptic future, but we are prepared to build for a cleaner, healthier future. It may seem to be a subtle distinction, but it's liberating. We've decided to use cob as the building method at Bliss Haven. In this post I'll put links to sites that feature cob. How could we ever build a stick house after seeing these images? Lucky for us, we have local experts in Austin at ClaySandStraw. When the road is in we'll have Kindra come look at the home site and see what she thinks about building for us. My kinda woman! In November we went to Janet Meeks' home featured in the image above, Yanaguana http://www.claysandstraw.com/projects/Meek/picsgallery/pages/A001.htm. She let me pound on the walls - the difference between straw bale and plaster wall board is negligible, but the cob is rock solid. Then I tested the earthen floor. It is indeed like leather in suppleness because it will dent and dimple. It's divine in coloration and feel, and it develops a sheen when it's polished with use and wear. The yogon is crazy awesome, we love the octagonal shape and construction using wood posts and beams!